In December of 2018, I ended a relationship that lasted for 20 years and five months. It was difficult. We created so many amazing memories. But sadly, it was time. 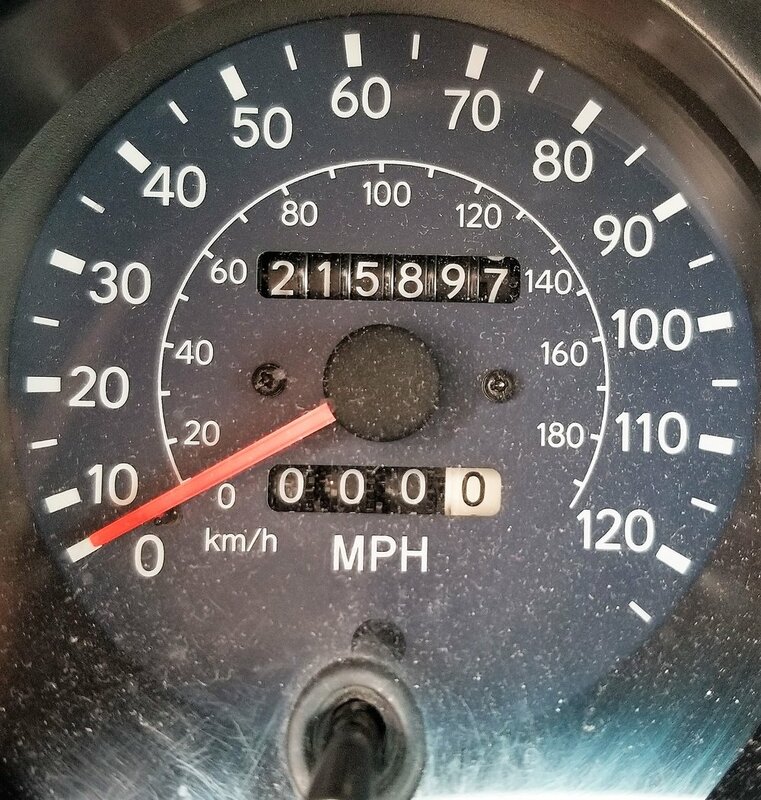 My 1996 Toyota RAV 4 served me well. Her name was Mabel. We first met in 1998, when she was “turned in” because her previous owner hit hard times financially and couldn’t continue the payments. It was love at first sight. I saw Mabel and knew immediately, she was the one. In that moment, I knew we were meant for each other. We did so much together over the years. This little car carted me up and down the hills and mountains of Colorado. She behaved well when I had emergency surgery, and my mother drove me around for six weeks. Mabel endured the heat and traffic when I returned to Texas in 2004. And she faithfully took me back and forth to Del Rio to care for my mother when she fell ill and passed away in 2016. I knew my goodbye would be a tearful one. But it needed to be done. Mabel was growing weary. Parts of her were being replaced quite regularly. She leaked oil badly. She burned gasoline quickly. And her clutch — the original clutch from 1996 — was starting to slip. Saying goodbye to Mabel was more emotional than letting go of a few former friends. You know the type: The Takers instead of the Givers. For them, I was ready to create space between us. I was ready for them to be on their way. But I definitely wasn’t ready to let go of Mabel. I generally buy pre-owned cars. I haven’t have a new, from-the-dealer car since 1991. So of course I figured that I’d buy another pre-owned, new-to-me car. I went to Houston for Christmas and told my brother Roland that I wanted to look around there. He was thrilled. When it comes to cars, he is a master negotiator and loves the hunt. Initially, we tried to work with a dealer for a pre-owned car, but their lack of flexibility made them feel heavy and out-of-touch. Maybe they forgot that a big part of buying a car is negotiation. So we moved on. Roland got on the Internet with a different dealership and had a response within 10 minutes. After a few minutes of talking with my brother, the salesperson offered a price on a new 2018 that started at $1,500 below the price of the pre-owned we were originally looking at. We showed up about an hour later. Gloria, the salesperson, was sharp and professional. We did a test drive and came to an agreeable number within an hour. It happened fast. Most of our nearly three hours at the dealership was waiting. Once we saw the finance guy, I wrote a check to pay for the car, then we waited for my new ride to be cleaned and delivered to me. Roland was amazing. Calm yet enthusiastic about the process that I had been dreading. He even made it fun! Later he told me, “Of course I was calm. You did the hard part. You had to write the check!” Point taken, but nevertheless, he made me feel safe in the midst of the discussions and decision-making. While we waited, Ro and I cleaned out Mabel. He knew I would be emotional, so he gave me time alone with her before we parted ways. I cried from a sense of loss but also from a sense of joy. Mabel was so lovely and faithful and sweet to me. Reliable relationships that last that long can never be taken lightly. I thanked her for our time together and gathered the last few things from the glove compartment and back seat. Oh, my Mabel — goodbye, old friend. I’ll miss you. So I now have a new 2018 Toyota RAV4. 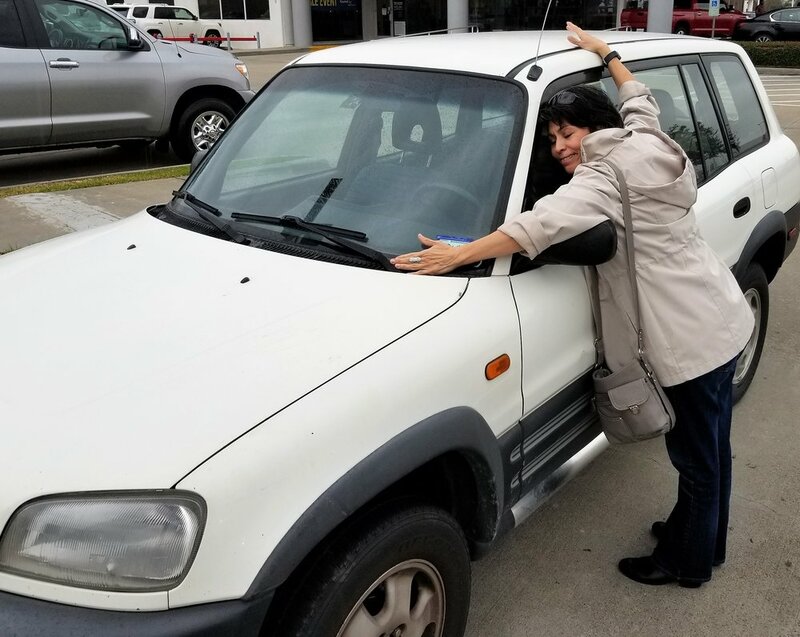 After 20+ years with Mabel, I couldn’t imagine switching to a different type of car. We’re still getting to know each other, and I’m quite tentative with so many things that I consider to be “fancy.” Things like connecting my phone via Bluetooth, not having to shift gears (what am I supposed to do with my left foot?! ), and watching the little screen when I back up. That may be silly to you, but it’s quite a luxury to me. Someday, I’ll pull out the manual and discover all the wonderful things this new car can do. For now, I’ll enjoy learning a little more about her every day. Just like I did with Mabel. Be #True to you, and have a Refreshing and Productive Day!